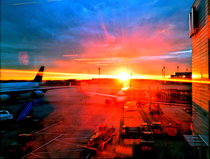 Morning Glow - Munich Airport - munichphotowalkss Webseite! ...sometimes it just needs a mobile phone and the right moment to shoot a great picture. Ist this one of them? What do you think?